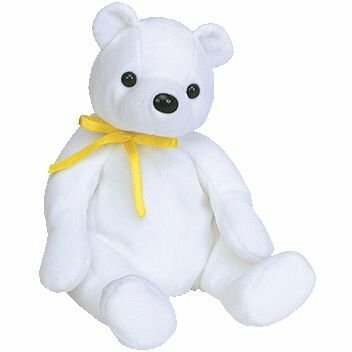 The Color Me Beanie bear is made from a white material with black button eyes and a black button nose. He has either a yellow, blue, red, green or orange ribbon tied around his neck. The Color Me Beanie bear Birthday Kit was released on 2nd September 2003. He was sold inside a plastic case containing six coloured marker pens (red, pink, orange, yellow, blue and green), a party horn, a paper hat to colour and a BBOC application form. The bear’s ribbon was available in five different colours; red, yellow, orange, blue and green. There were three other Color Me Beanie Birthday Kits available containing either a cat, dog or unicorn Beanie Baby. He retired on 16th July 2004.